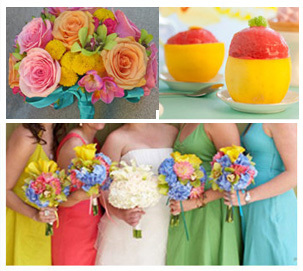 A Summer Sorbets Arch Wedding card to make a Wedding Day gift. The arched window of the card frames a detailed floral border. Sizzling hot peppers blend with cool sorbet colours in a spray of summer flowers. A full alphabet is provided to add your own names and date in blue. The design also has golden wedding bells and gold wedding rings. The Summer Sorbets Arch Wedding card cross stitch kit has only the best quality materials ~ Zweigart fabric, DMC thread, metallic threads, envelope, needle. 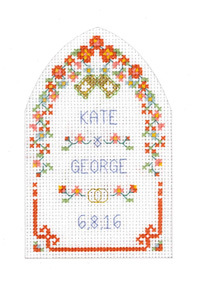 This Sorbets Arch Wedding card kit is from the Decorative Textiles collection. 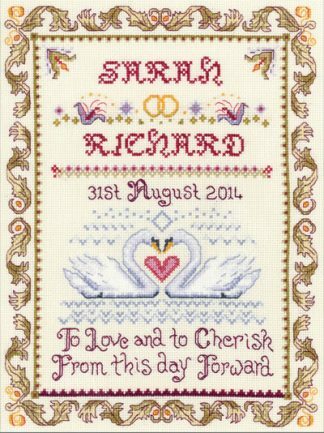 The range has a wide choice of wedding cross stitch cards and samplers. Wedding traditions and customs vary greatly between countries, cultures and religions. Hindu tradition regards rain on your wedding day as good luck. For good luck, Egyptian women pinch the bride on her wedding day. In UK newlyweds showered with rice would never go hungry. Rice paper confetti has become the modern day replacement for rice. Couples in the Czech Republic are showered with peas. A Swedish bride puts a silver coin from her father and a gold coin from her mother in each shoe. This is to ensure that she will always have sufficient wealth.